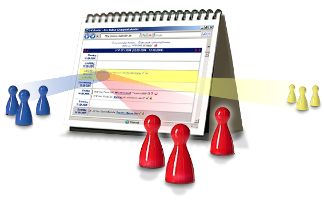 CCalendar is a powerful tool for location-independent calendar-management via internet. for organisations / companies / groups / communities / clubs and even for individuals which have to make an appointment with others. Fully automatic publication of seleted appointments on your homepage - without maintenance! (The latest appointments for the day are sent via email every morning at 1:00 am to each user individually. "Generally speaking, this calendar is an absolute supertool. It covers almost all needs and is easy to use. You were very successful here, congratulations!!!"